One of the challenges when writing about bike racing is that there are shitloads of riders. You look ahead to a cricket or football match and you’ve got at most 22 people to write about. This makes it easier for less-than-ardent fans reading your work to get a grip on proceedings. In contrast, your average bike race has a couple of hundred participants and while most don’t stand a chance of winning, it’s still easy to find your preview getting away from you a bit as you name rider after rider who might be in with a shout. Fortunately for me, Tommy Voeckler won the Tour of Yorkshire, which made it look like I’ve half an idea what I’m talking about. I have, at most, a quarter of an idea – but viewed from the right angle, it can look like more. 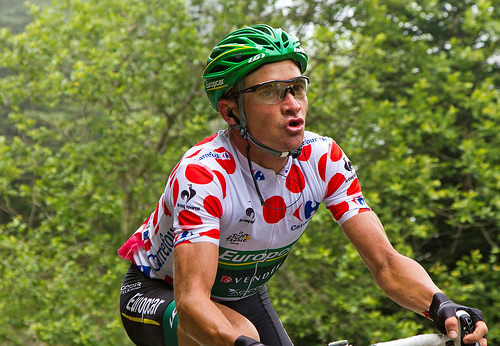 Voeckler is a fading force and I’d been in two minds about whether to mention him at all in my race preview. Good on him for masking my foolishness for another day. He’d raced for a mid-stage time bonus on stage one, but it basically all came down to stage three. A very tough stage of seemingly endless rises and falls saw the front group ever-ensmallening. It once again proved that Britain’s tougher terrain makes for the season’s most entertaining and unpredictable racing. A few kilometres from the finish, Vockler he and Nicolas Roche were last men standing. It came down to a sprint and the slightly Frencher man (Roche, despite officially being Irish, is pretty damn French himself) was just that bit cannier (and faster). With everyone else further back, this and the time bonus was enough for him to win overall. Infuriatingly – indeed almost tragically – there was no TV coverage of the women’s race due to some sort of knackery within the plane used to relay pictures from helicopter and motorbikes. This meant that no-one got the opportunity to see Lizzie Armitstead and a couple of co-conspirators trying to beat the peloton to the finish despite unhelpful terrain. Sadly, she was caught a couple of kilometres from the line and Kirsten Wild, a Dutch sprinter, got the win. I rather hope they give the women a more challenging route next year. Assuming the pictures are broadcast, it’ll make for a better spectacle and getting to see the best of Armitstead would surely be a great way of promoting women’s racing. This Tour de France-ish week-long race was won by Nairo Quintana ahead of Thibaut Pinot. Chris Froome lost the opportunity to race for the overall thanks to a puncture on stage two, so it wasn’t really a fair comparison of the two favourites for this year’s main event. Froome did win the big stage from a break though and also made a faintly unhinged and ultimately fruitless bid to win in similar fashion the following day. The Giro d’Italia – the biggest race you’re not going to be able to watch this season (unless you’ve got Eurosport). It starts on Sunday. I’ll aim to do updates after each stage, but, you know, let’s see how it goes. That’s quite a commitment. Sign up for emails from this site to ensure you don’t miss whatever I do write. Here’s how and why you should do that. Let’s see how many riders I end up naming in my Giro preview later this week..